This name only exists in English, but its origin is, nonetheless, uncertain. It has been interpreted as 'Cave Mountain'. There is a cave passing through a spur which is almost blocked, but, as pointed out in PNNI, this cave is actually on neighbouring Slievelamagan. It is more likely that the word 'cove' refers to the corrie which separates Cove Mountain from Slievelamagan. 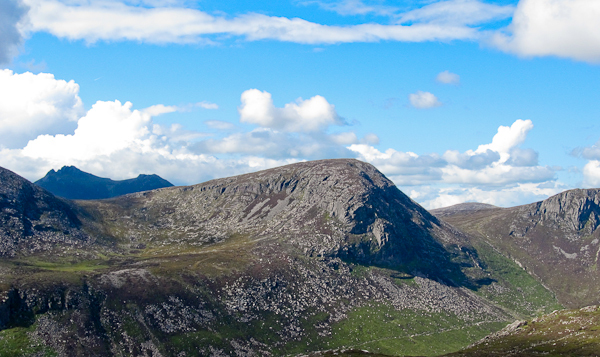 Cove Mountain is the 187th highest place in Ireland. Park at Carrick Little carpark at J345 219 A, room for 10-15 cars. Note the carpark fills quickly on weekends but it is possible to park on the roadside nearby.